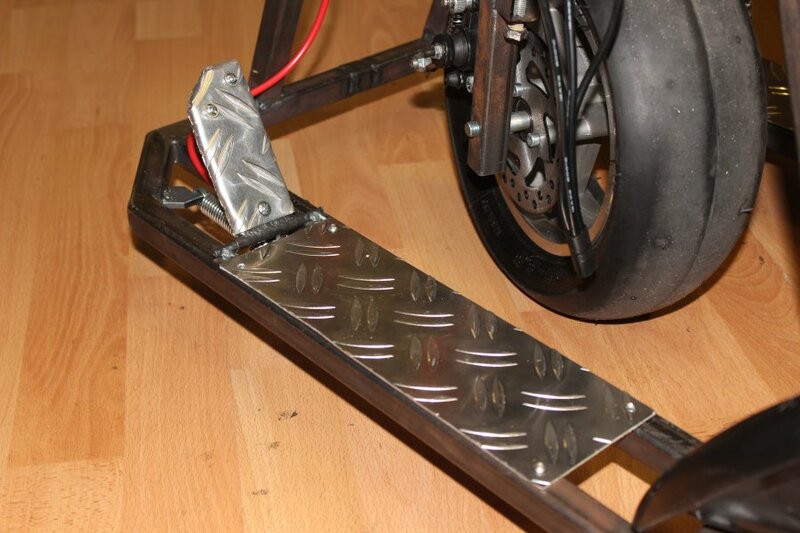 Brake and accelerator are going to be operated by two pedals. Brake left and accelerator on the right hand side. 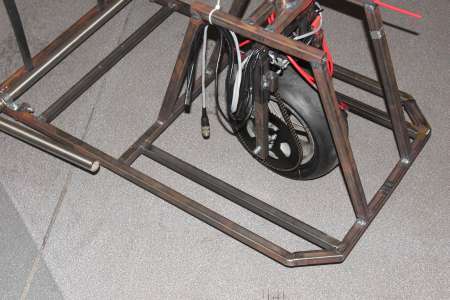 The pedals will be connected to some bowden cables. 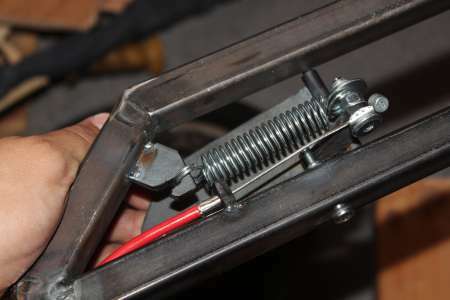 Starting with the brake: The bowden cable (red tube) is attached to the disc brake and is wound 2 1/2 times around the steer tube such that the front wheel can be turned 270° in each direction. The bowden cable just winds itself on or off without getting caught somewhere. The pedals will be at the front end of the frame. For them to be mounted and to be able to put the feet somewhere a steel section needed to be welded on both sides. The seat now had to be modified to fit in there. A steel tube (9mm outer diameter, 7mm inner) was welded to a relatively wide steel bar. 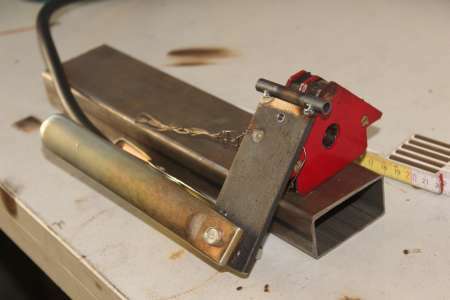 A lever on the underside later pulls the steel cable. 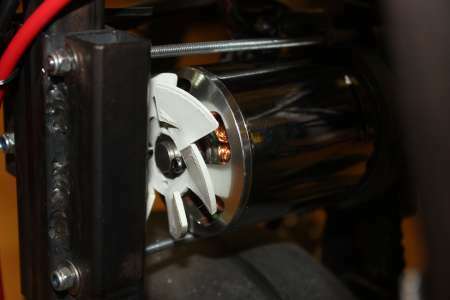 The bowden cable needs to travel about 2cm for the disc brake to fully brake. 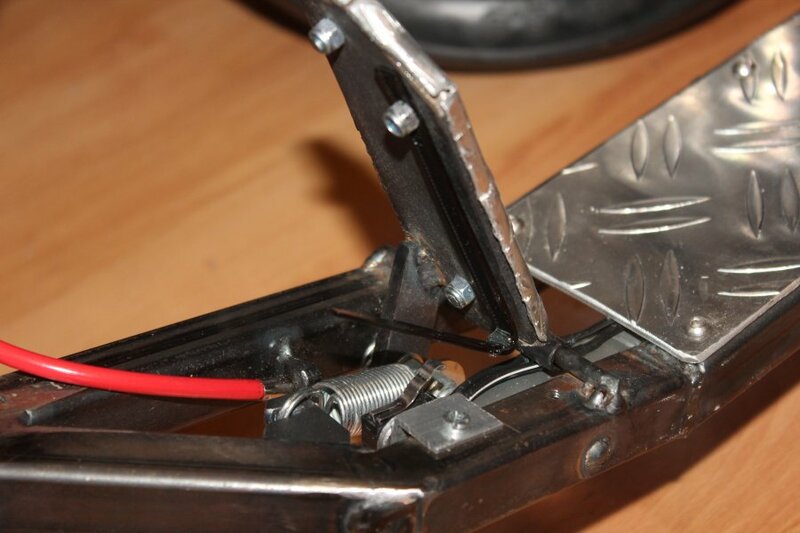 For that the cable will be mounted 3cm away from the pivot point of the pedal. 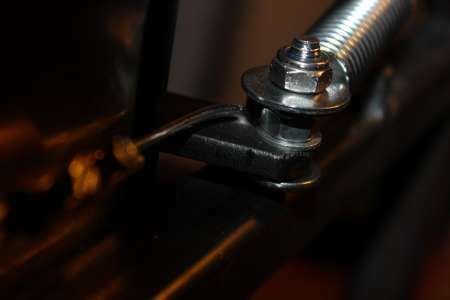 The pedal roates about 45°, so theoretically the end of the lever moves 2,12cm. 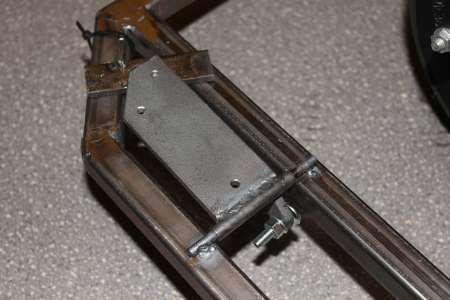 After welding the pedal together, the steel tube gets pushed on a 6mm round-bar steel wich then is slightly welded to the frame. 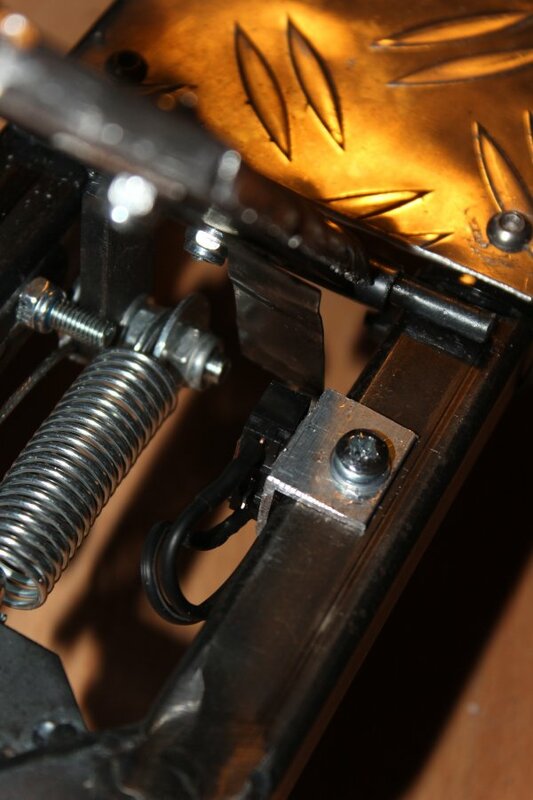 The pedal should turn back up by itself and to pull the bowden cable back. 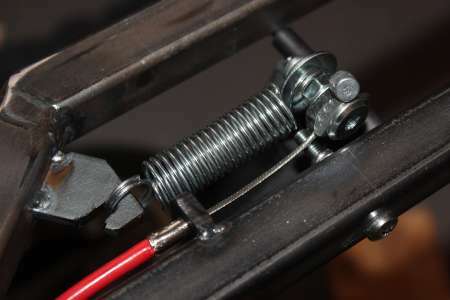 Therefore a spring is attached to the brake pedal and the brake itself. 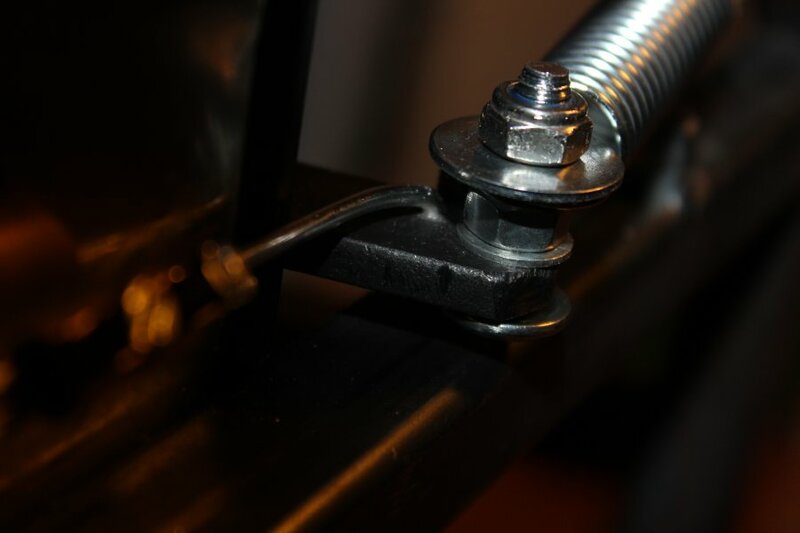 A screw under the pedal limits the upper angle of the pedal. To deposit the feet and just for the look, the pedals and the frame base get some channeled sheet of aluminium attached to them. 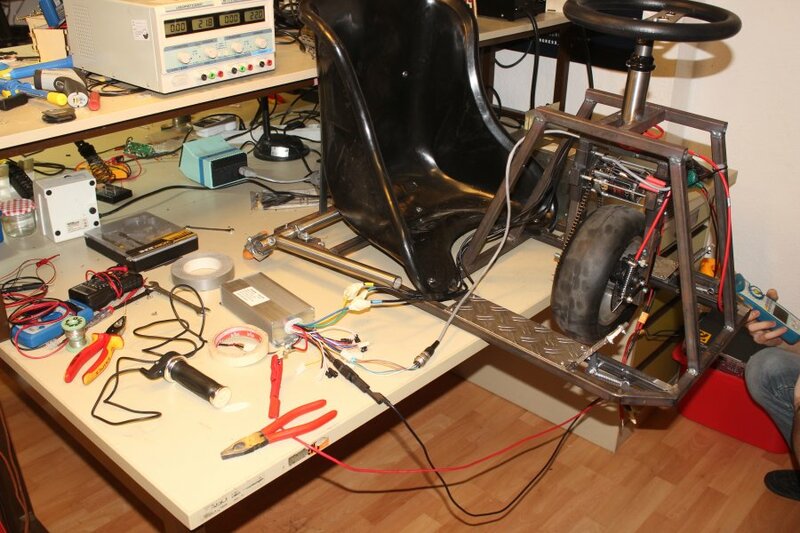 For the throttle the controller needs a voltage from 1 to 4 volts. 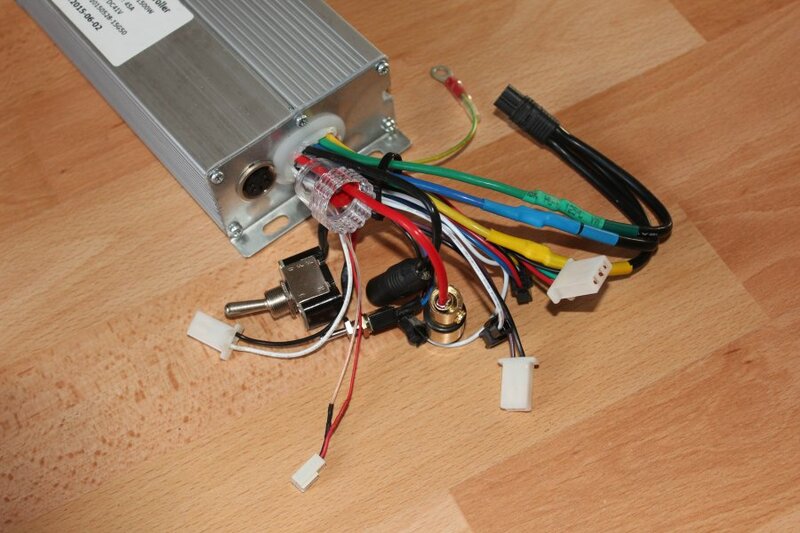 From a damaged hand throttle I salvaged the hall sensor, wich is a SS49E. 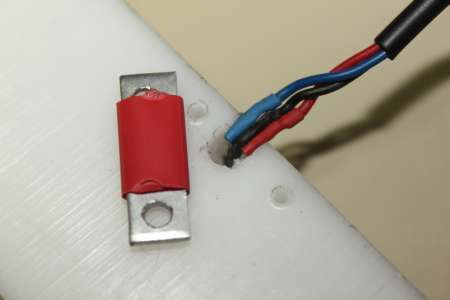 If a magnet is moved along the hall sensor from its south to its northpole the sensor puts out a voltage from approx. 1V to 4V. 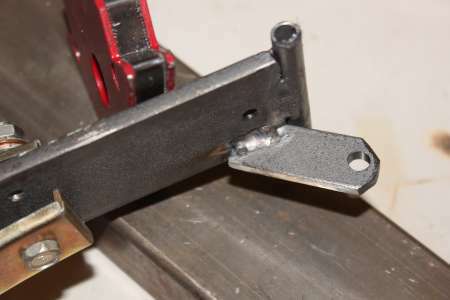 For that I drilled a 7cm long hole in a block of POM, in which the 15mm long magnet can slide in. 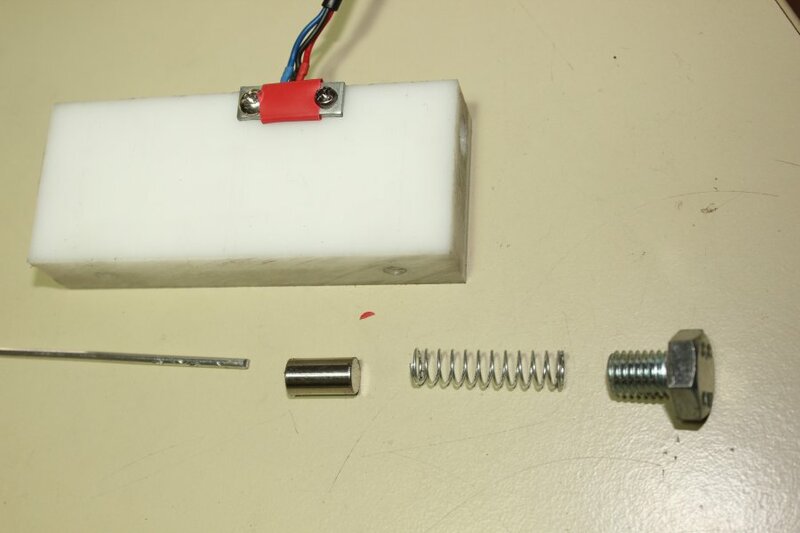 A compression spring and a M10 adjusting screw keep the magnet with one pole over the hall sensor. 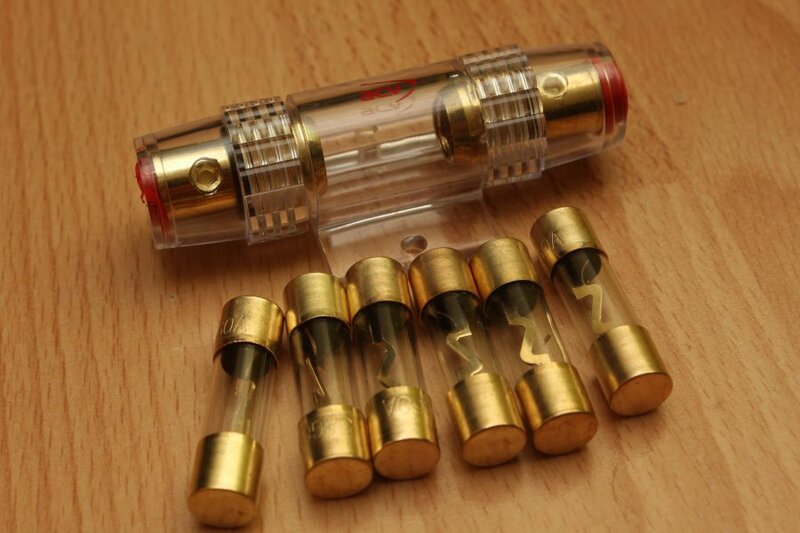 From the front a 2.5mm thick aluminiumrod pushes the magnet up to 15mm in so that the voltages rises from 1V up to 4V. 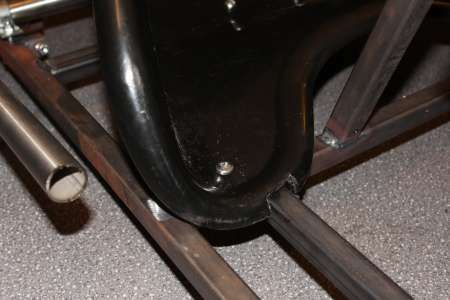 Later, the white block of POM was mounted unter the channeled aluminium sheet. The aluminium rod is connected with a luster terminal to another aluminium rod wich is finally attached to the pedal lever. Most E-Bike controllers have the ability to disable the throttle if the brake gets pushed. 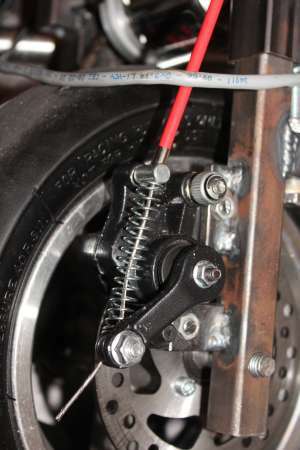 A momentary switch at the brake has to be connected to the controller. I installed a microswitch under the brake pedal. A bent metal sheet pushes the switch if the pedal is up. If the pedal is pushed down the switch gets untriggered. The controller is wired to the switch as "normally open". A short time leap: Later I had to exchange the metal sheet solution by a piece of zip tie, wich presses the microswitch directly when braking. Because the mini jasontroller recently gave up, I got myself a bigger one. It's a "GREENTIME 15 Mosfets 48-84V 1500W 45Amax Dual mode Sensor/Sensorless Brushless DC Motor Controller". It's advertised with a current limit of 45A, wich is at 50V 2,25kW, .. we'll see. My unit made it'S way somehow through the QC, if theres one anyway. At least the retailer sent a new one as replacement. But this one seems to work, so I'm going to use it. 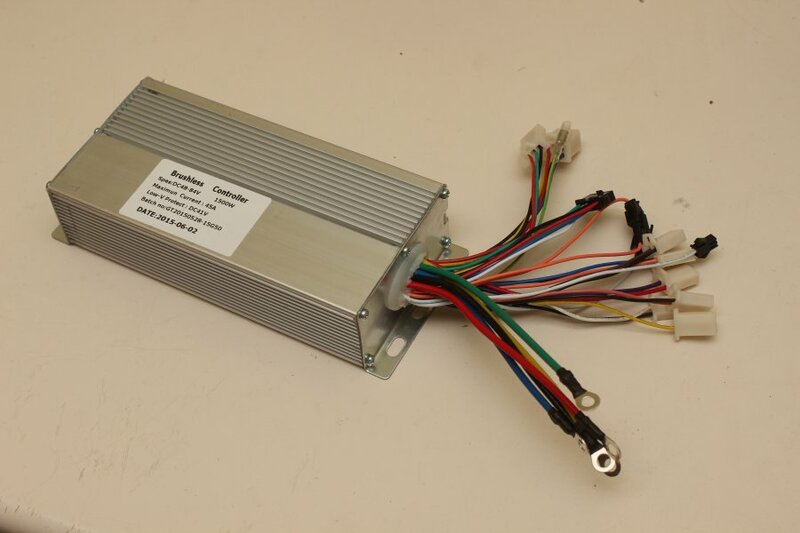 To the the controller and it's sensor learn function I connected it to two 24V 50A server powersupplies. 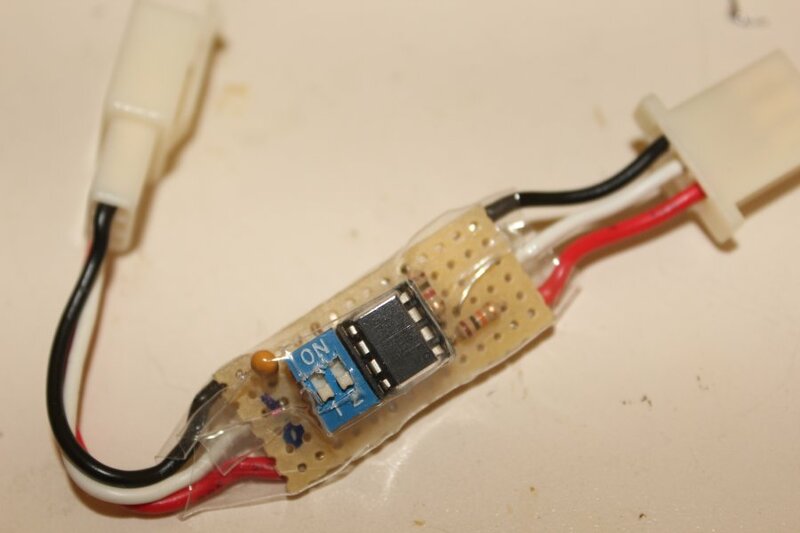 In opposition to lipos those will limit the current if something goes horribly wrong. The hall sensors need to be places so that one of them is located between two stator windings. 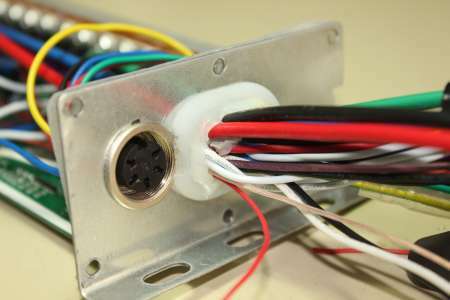 Then the two white wires ("learn wire") need to be connected together. 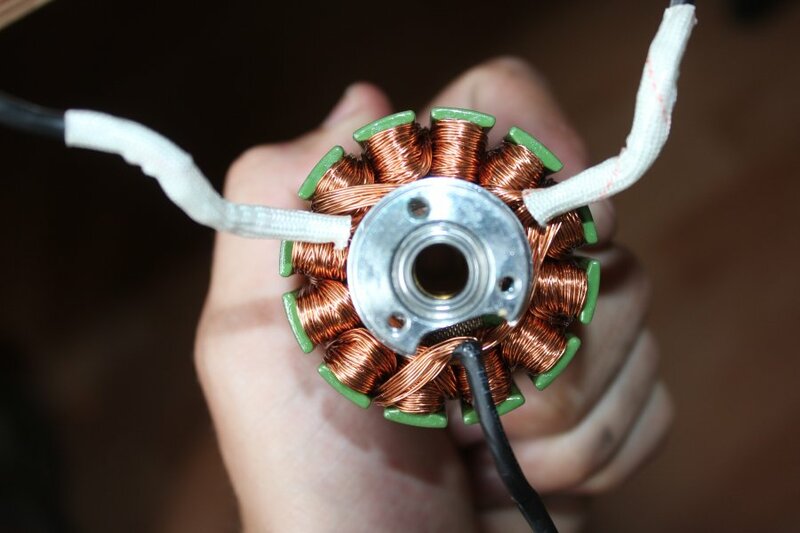 After powering up the controller the motor starts to spin. After about 2 seconds of spinning the controller has to be disabled/disconnected. 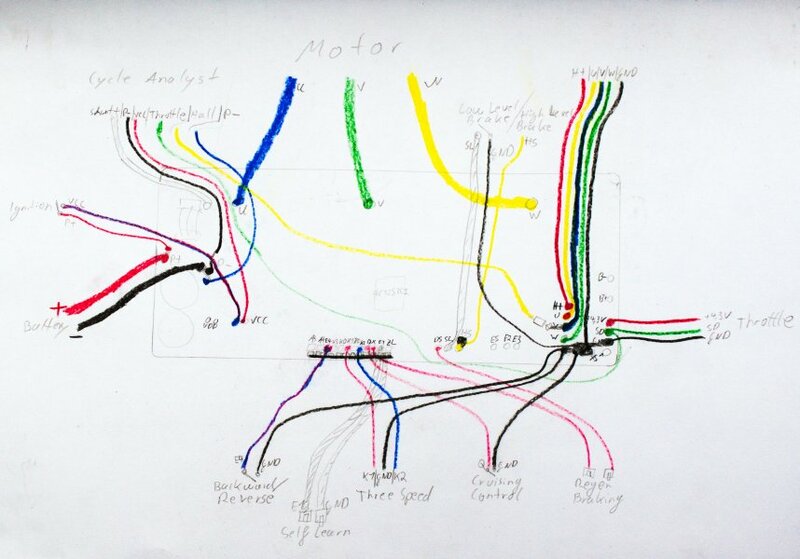 Now the controller has learned the sensor/motor combination. 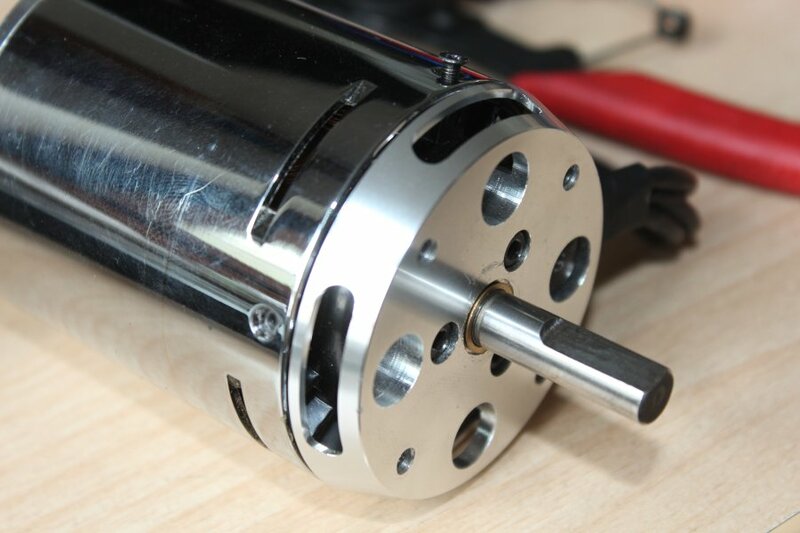 If the motor turned the wrong way this procedure has to be repeatet. 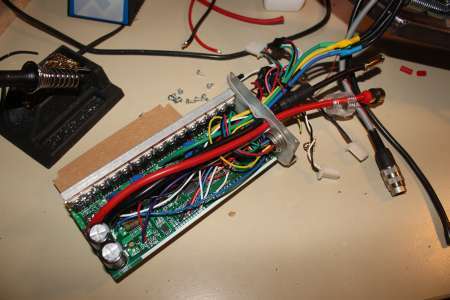 After that one should not forget to unplug the white lear wires. This learning thing does not include the exact positioning of the sensors, wich has to be done manually. 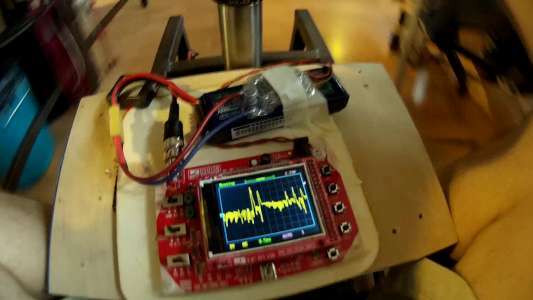 The good thing about this greentime controller is, that it will switch to sensorless mode if it reached a certain speed. 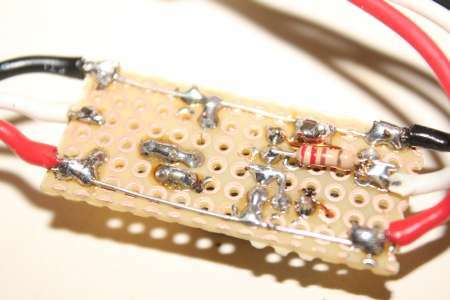 Here again the connections on the pcb. All the unnecessary wires such as cruise and regen. 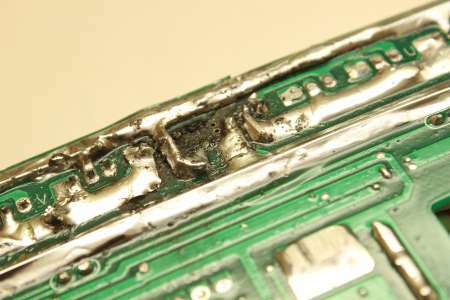 braking were unsoldered direclty from the pcb. 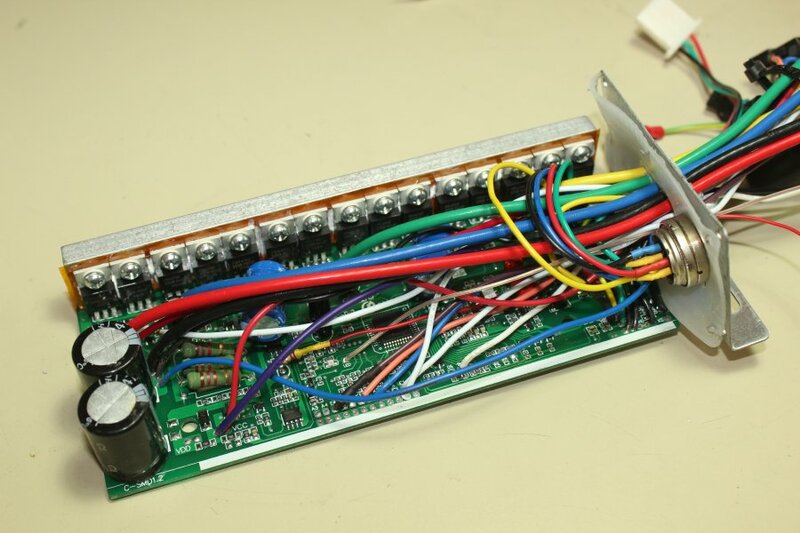 I'll connect the hall sensors the same way as it was planned on the first controller over a 5 pin Tuchel connector. For that socket I needed to drill a hole in the controller case. To be able to see what the controller does I added two wires for a status LED. 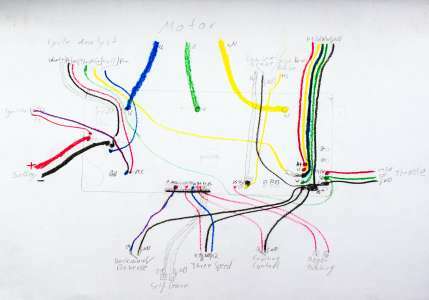 I also left the "cycle analyst" in there because one can get some status information out there like a hall signal (for a speedometer) or the voltage across the shunt (for the current). 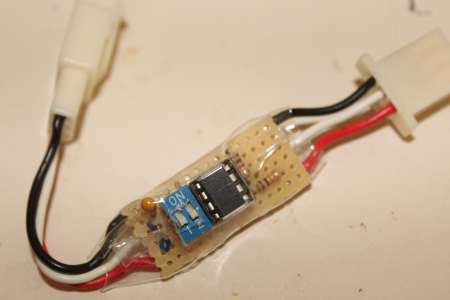 The reason why I used current limited power supplies instead of Lipos is safety against high currents wich may burn down the lipos. 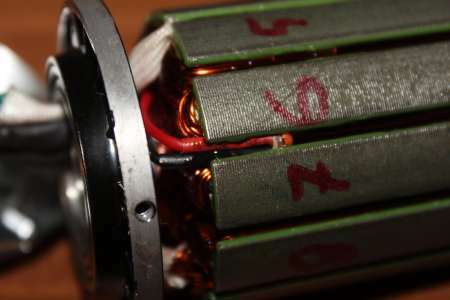 Especially concerning the positioning of the three batteries I dediced for myself to add a 60A AGU Fuse, as they can be found in car hifi systems. 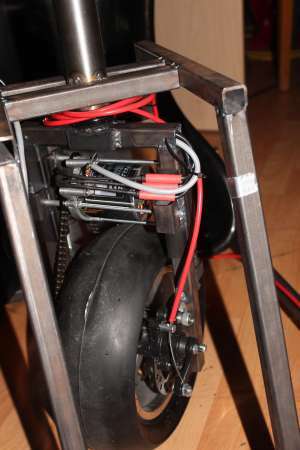 Now the cable harness looks a little tidier. The motor wires are soldered to a MT60 connector, the "ignition" got a killswitch and the "three speed" is wired to a three way switch. I didn't soldered the "Three speed" to permanently high, because the motor only startet smoothly on low speed. On the left hand side of the AGU fuse I mounted a blate-type fuse holder, which later fuses the lighting. 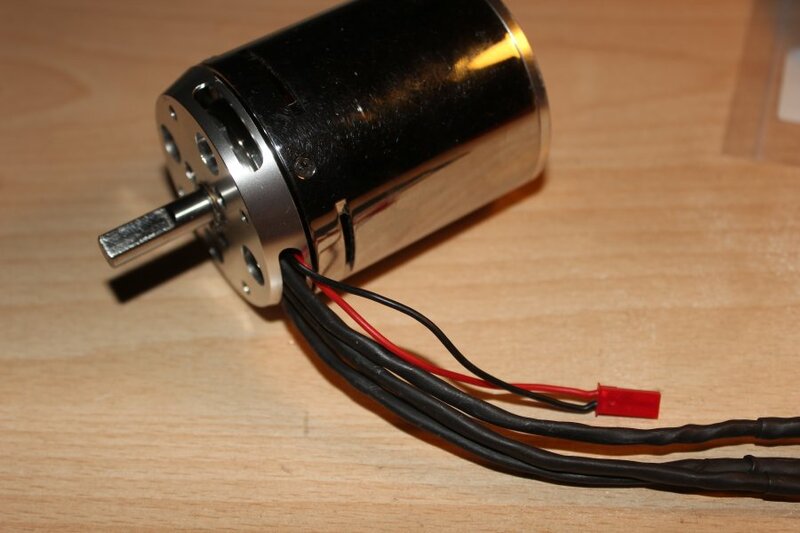 The SK3 motor is designed for big rc planes where the air travels right through the motor. I mounted the motor sideways so theres not much airflow so I printed a fan flat with 2mm height out of PLA on a 3d printer. 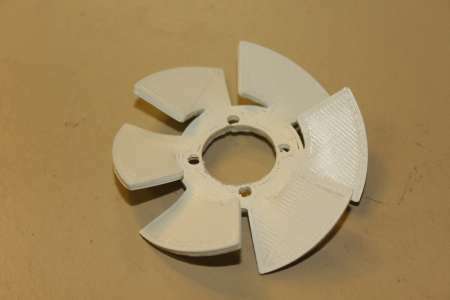 After printing I heated the blades with a heatgun and bent them to an angle. Then I went out and tested the cart a bit more. 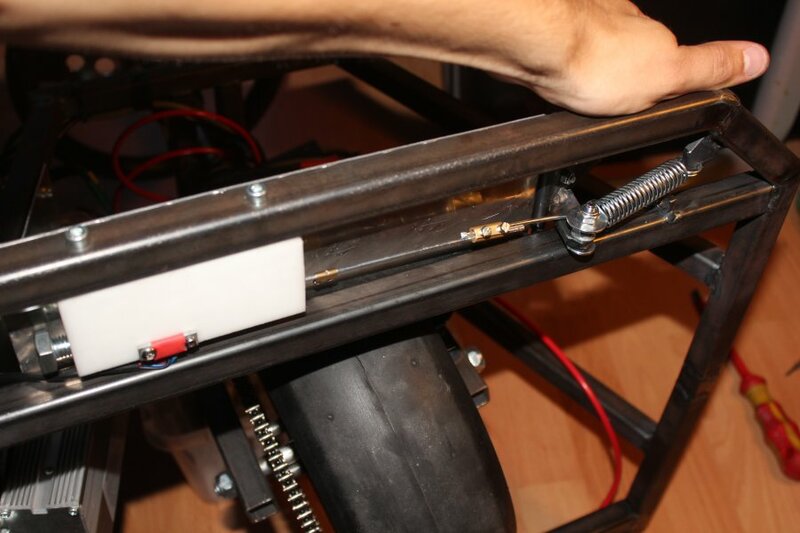 The accelerator is quite touchy because the cart quickly accelerates wich causes my foot to get pushed back slightly wich then decelerates the whole thing and so on. Besides some hall sensor tuning I noticed the motor getting quite hot after 5-10 minutes rather slowly (20km/h) driving aroung. 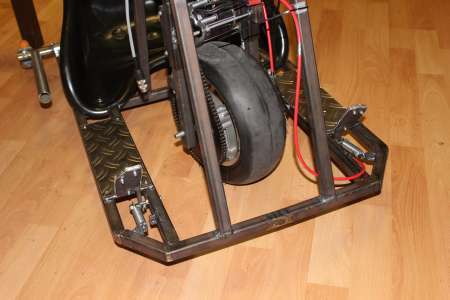 Maybe thats from the high gear ratio (11 to 78), the big tire (28cm diameter) and the high KV motor (192 KV). The calculation gives a maximum speed of 71.5 km/h (28cm*Pi* 11/78 * 50V* 192KV) wich also means inefficiency at low rpm's. 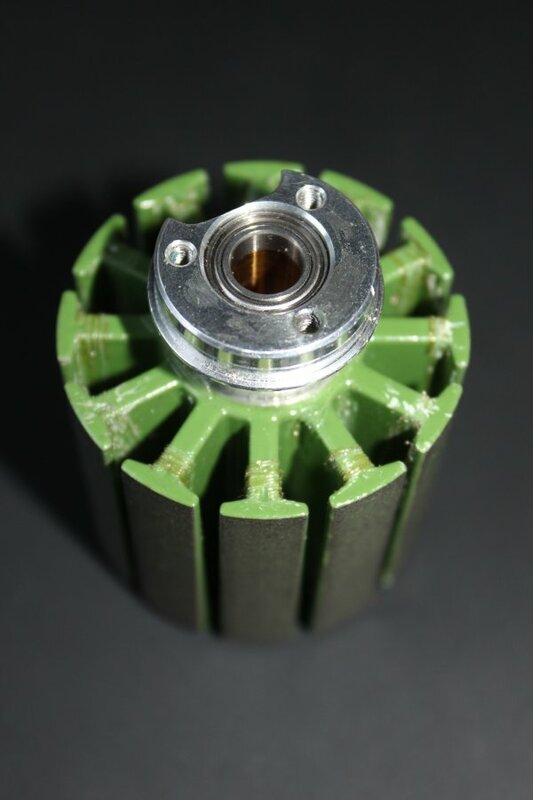 By looking at the equation the best thing to reduce the speed is to lower the KV, reducing the wheel diameter and/or increasing the gear ratio is difficult because of the limited space. 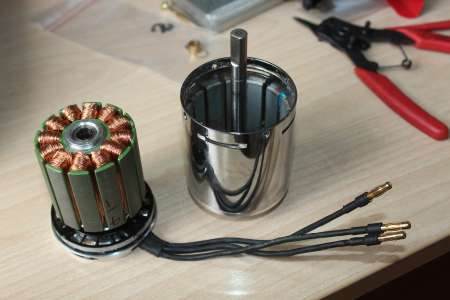 After removing the circlip and unscrewing the four screws on the side of the rotor it is recommendable to put the stator into a vice and pull the rotor straight up. The motor is wound as dLRK with 15 0,4mm magnetwires in parallel 7 times around each armature core (=14 Turns). 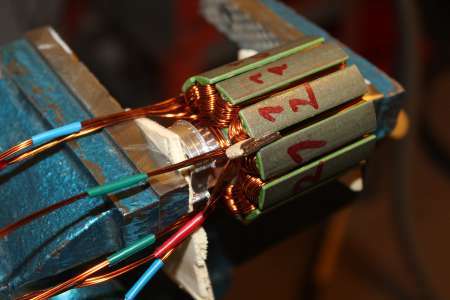 That makes 192KV and a measured internal resistance of 30 mOhm per phase. Some hours later all the copper was removed. To get more KV, more turns are needed. 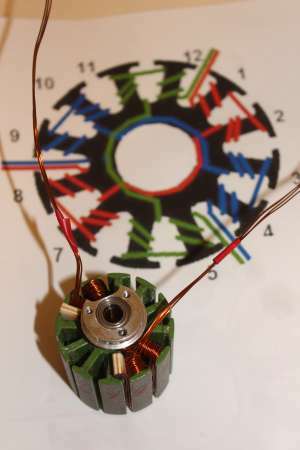 Putting 9,5 turns per armature core resp. 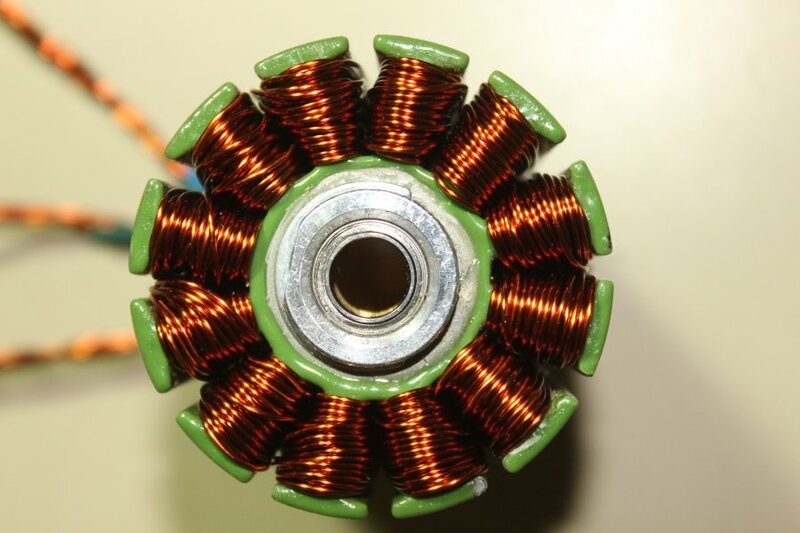 19 turns per pole in the equation I got something between 100KV and 150KV, wich should be ok. After I knew how much turns I'm going to put back on this motor I used drivecalc to calculate how much magnetwire and how many in parallel I need for a given thickness of 0.65mm. I decided to go for 4 in parallel. I went for the dLRK Evolution scheme siehe bavaria-direct.co.za where the ends wich need to be connected together come out directly next to each other. The most difficult thing was to keep concentrated and not miscounting. Countless hours later the motor was finally re-wound. A glued in NTC temperature sensor will later tell the core temperature of the motor. 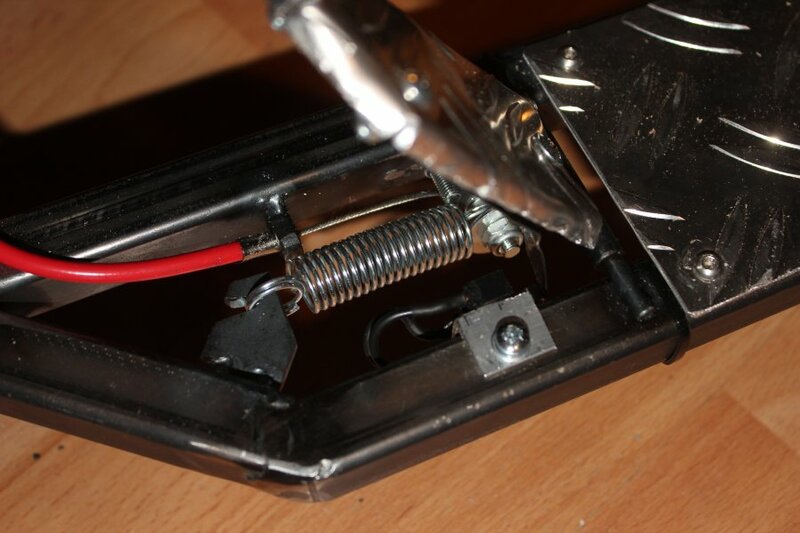 Also I used Epoxy to secure the wires so that they don't get caught on the rotor. To determine the KV, the motor can be put in a lathe. I used an oszilloscope to measure the no-load voltage over one phase. 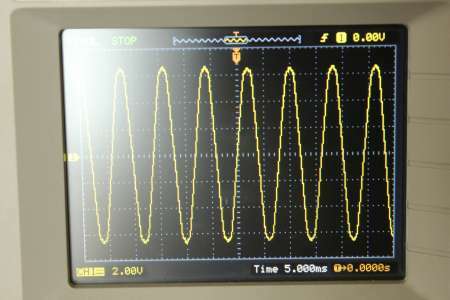 From the frequency of the sinewave (here 124Hz) one can calculate the speed of the setup (124Hz * 14Poles / 2=868 rpm). 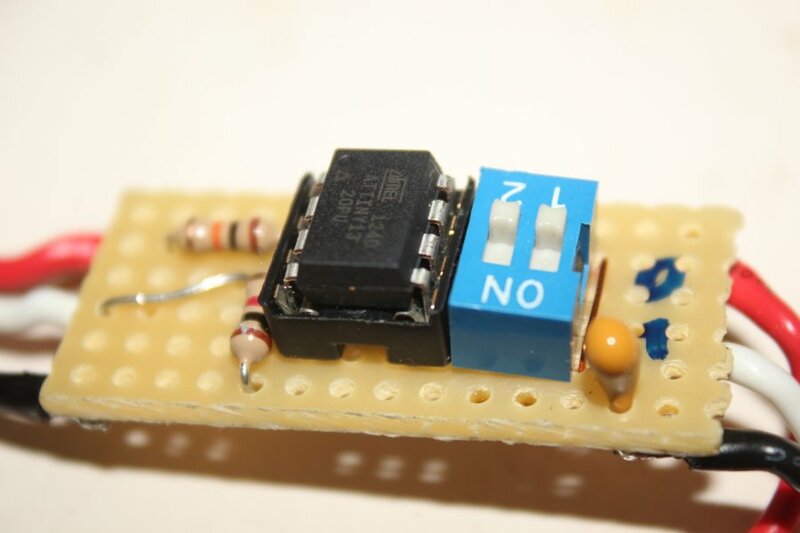 Also one needs the rms no-load voltage (here 4.8V). Putting that into the Colin-Dedman-Formula (rpm/(Vrms * sqrt(2) * 0,95)) to get 135KV, wich is pretty acceptable for my purpose. 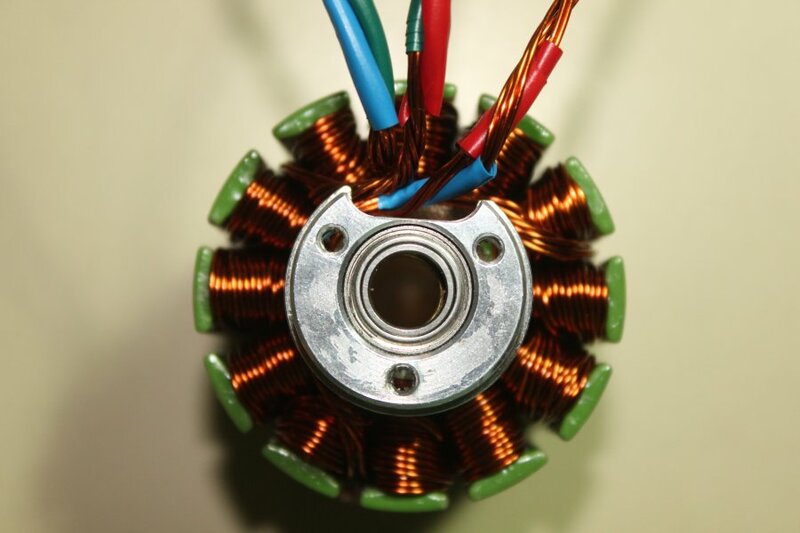 First driving tests showed that the motor current per phase is now 9A at 10km/h, before it was over 15A. 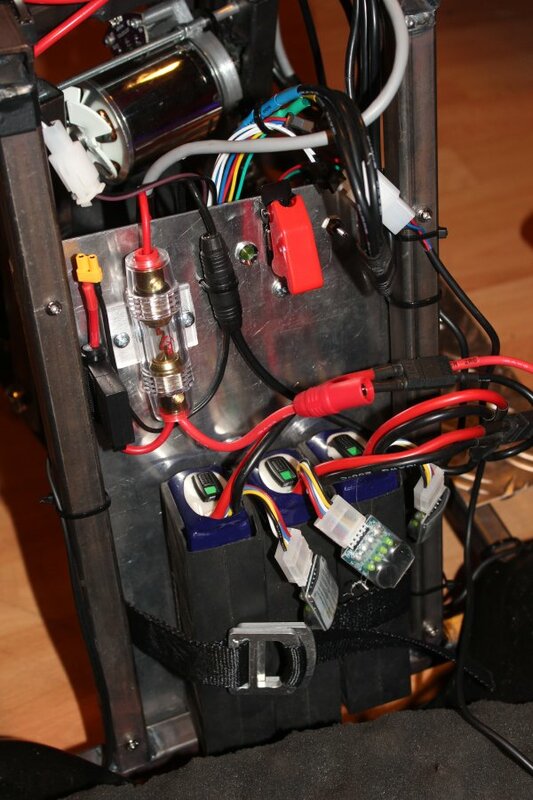 The motor is now re-winded, but the stuttering problem of the controller is still present. 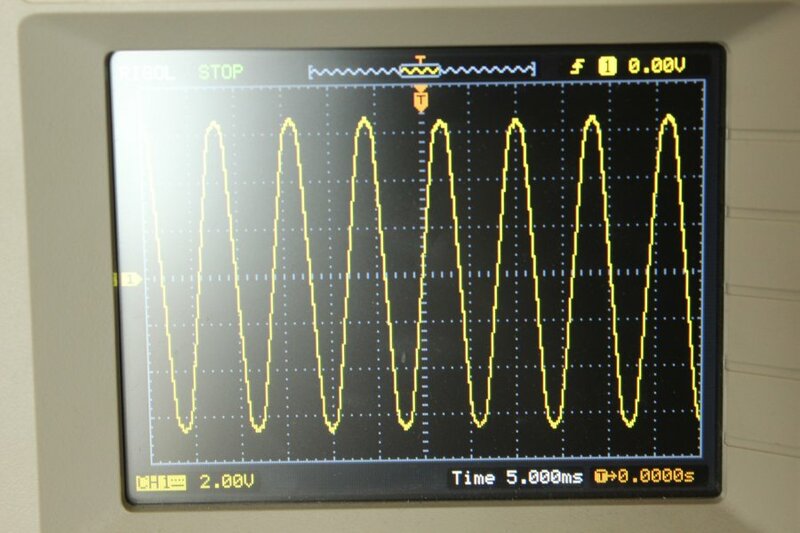 With a "mini oscilloscope" onboard I monitored the ripple voltage at the input (50V) of the controller. These are two screenshots at the moment where the motor began to stutter. 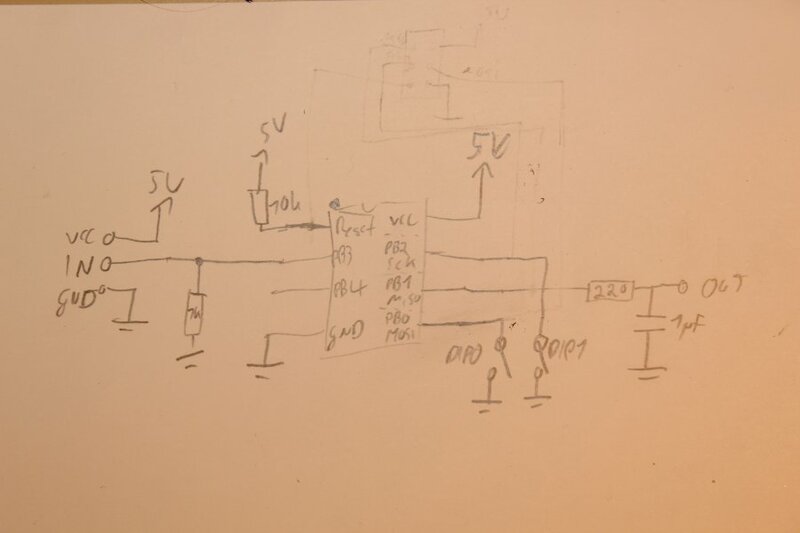 At those points in time the input current was at a little over 40A (so it could be caused by the current limitiation of 42A) and the motor current was at around 200A. If these are just consequences or the cause, idk. 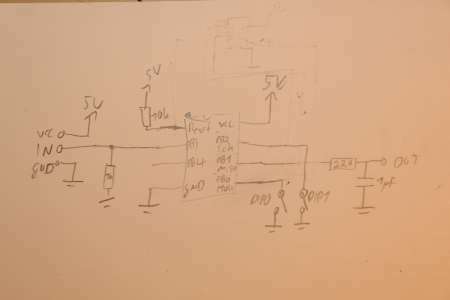 To at least minimize the problem of a collapsing input voltage I replaced both input capacitors (2x 470uF 100V) with two 1000uF 63V. 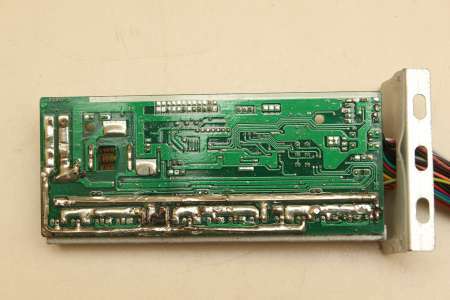 Also I replaced the input wires with big 10AWG silicon ones and thickened the PCB traces with some solder. It seemed like the stuttering now appears a little less/later, even tough it's there on high load and still not acceptable for me. 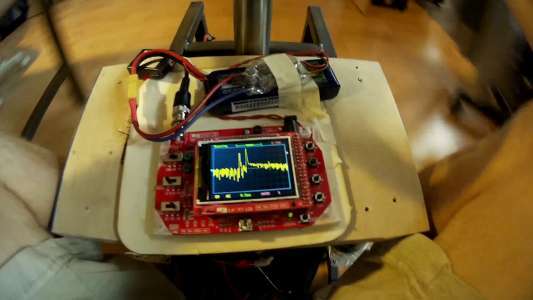 In the lower speedrange the Greentime controller is very sensitive and hard to control accurately, even if its running with sensors. With an Attiny13 I build some sort of low pass filter for the throttle input. 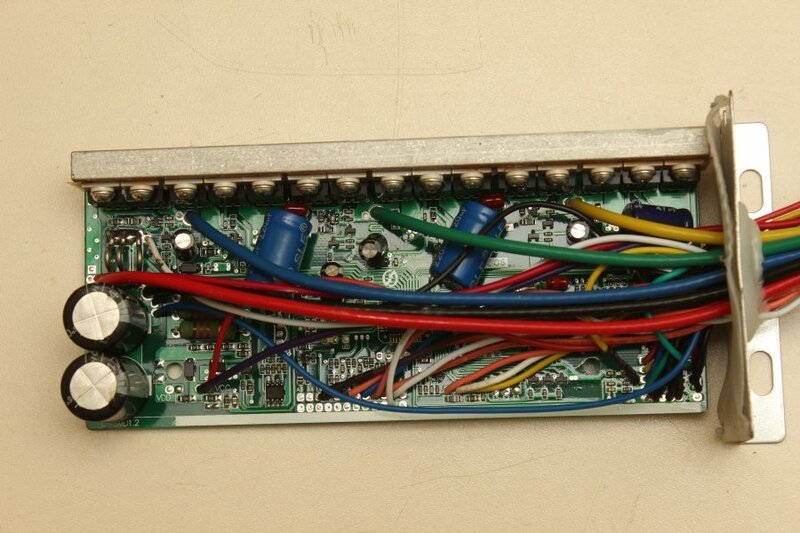 Four modes with preset parameters are selectable through two dip switches. 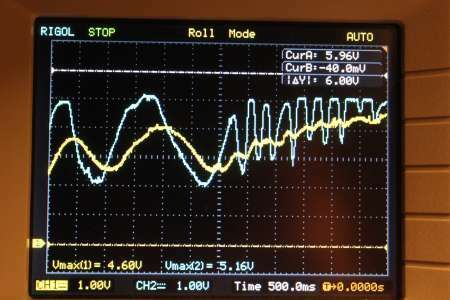 Here the behaviour on an oscilloscope (500ms/div). Blue is the input and yellow the output of the filter. With this filter the jerkyness on acceleration should now be suppressed. 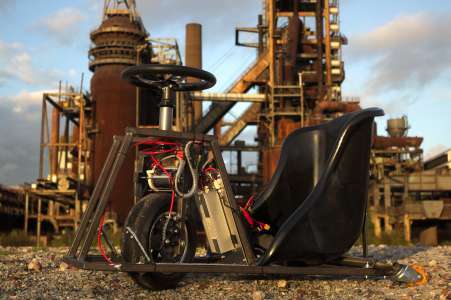 Cart turns slightly to the left if steering wheel and front wheel are straight. Rear axle wonky? Lipos slip out. 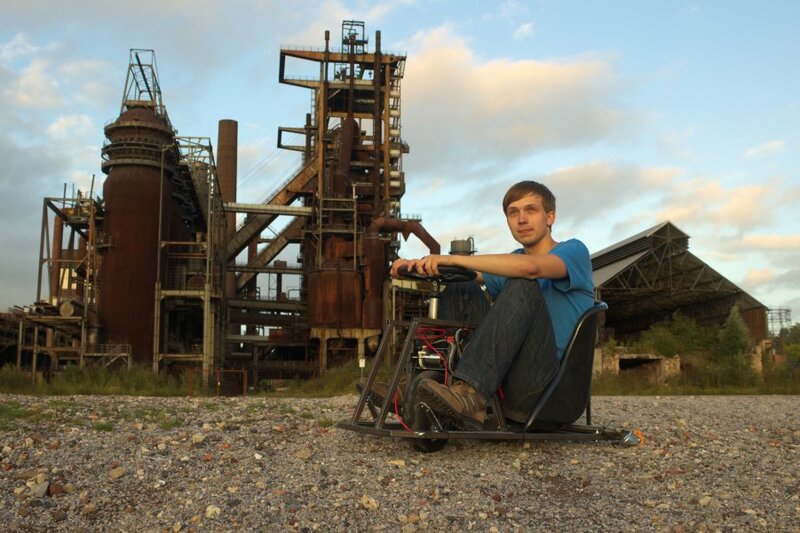 Better mount needed! Backwheels need to be less angled in non-crazymode.